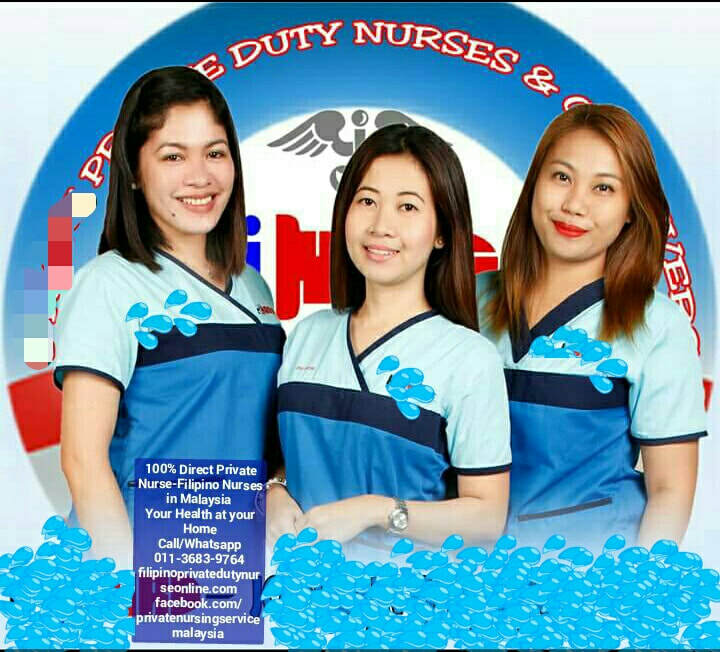 Private Nurse Service in Malaysia by Filipino Private Duty Nurse Online (FPDNO) is a freelance private care providers composed of RELIABLE, HONEST AND TRUSTED FILIPINO NURSES AND CAREGIVERS. The group is managed by founder and coordinators making sure the security of clients interms of qualificafions and work experienced in handling patient condition. Our nurses and caregivers are professionals and qualified. They have under gone a proper education and training acquiring the knowledge and skills of caring. Our carers are eligible to our imposed job criteria and we furnish hiring employers to have a copy of the carer personal details. We provide our nursing service professionally at the comfort of patient own home. Please choose from our services fitting to your nursing needs. Connect with us in whatsapp or call us for further details. Our health care providers are below we have male and female staffs. - minimum hours is 10 hours. charges is at hourly rate, additional transportation charge per day and once meal per shift. - nurse and caregiver rates varries from qualifications. - charges is by monthly base with weekly off every Sunday. Rates for nurses and caregiver varries. 1. All daily activities-bathing, chanhjng, toileting. 3. Preparing simple meals fir the eldely person. 4. Escorting the elderly person should he/she need to leave the house. 5. Keeping the elderly person company at home. 1. Wound Management-pressure ulcer, diabetic wound, traumatic wound (from motor vehicle accidents) suture removal. 2. Nursing procedhres- NG tube insertion and changing, urinary catheter insertion and changing, tracheostomy management, stoma management, respite care, administering medication, management of infection, IV line, monitoring of intake and output, blood sugal level. Our model patient was surprised of our Christmas gift sponsored by his God son. The happiness and joy he felt was an unforgettable moment of his Life. The Godson together with the Private Nurses plan to surprised him, it was a teary eyes and touching to see our patient with smile and laughter.His happiness is priceless. Merry Christmas Uncle Fred. 24-12-17 5pm. Our Model in the Video is a sweet patient of ours.He is very fantastic and jolly person. His favorite word is " Beautiful" that vibes him as a happy personal with full of humor. Isn't he amazing. Our patient is our friend. We Thank You Sir, patient son who made the best decision to call us as his Father's 24 hours Private Nurse. You did the right choice to call us for your Father Nursing needs. Nene is a wheelchair bound patient, Diabetic and Old age. Our Private Nurse works with the family for longterm care and We thank patient's family for allowing us to use this video as our model patient. How to verify a Professional Nurse in the Philippines. Follow the step in the picture. ​Tagged: private nurse,private nurse klang valley, private nurse in penang, private nurse in selangor, private nurse in melaka, private nurse in negeri sembilan, private nurse in johor bahru, private nurse in petaling jaya, private nurse in ipoh perak, private nurse in kajang, private nurse in damansara, private nurse in kuala Lumpur, private nurse in cheras, private nurse in malaysia, private nurse malaysia, hire a nurse, nurses at home, home health nurse at home, elederly care, home care service, filipino nurses, caregiver, nursing care,home base nursing. Home Care with Love and Dignity is who we are. Thank You for Trusting us to be your choice of Private Nurse.